In our last post, we saw how ancient gunsmiths would have manufactured barrel clamps and the extension rod. In today's post, we will study the last few bits of ancient rifling machines and then study how they would have all been put together. 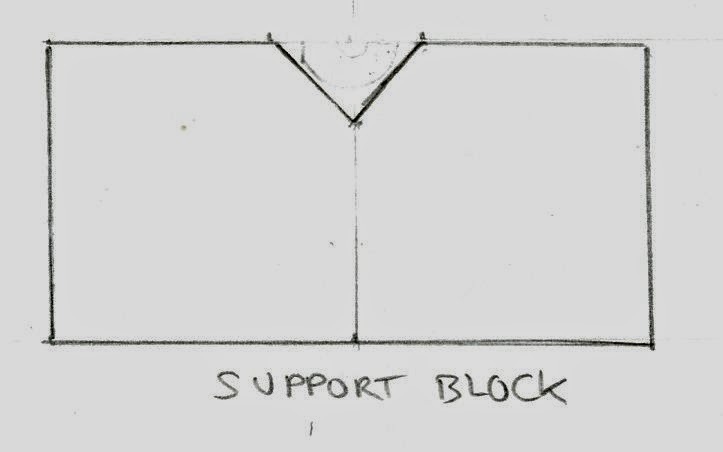 The first part is the supporting block. This is simply a block of wood that is used to support a barrel while the rifling is being cut. The simplest way to support a cylinder is to cut a v-shaped groove in a block of wood and the cylinder will be supported by the sides of the groove. Typically, ancient gunsmiths chose wood blocks made of pine or maple and simply carved out a v groove on top of each block, using a wood chisel and a mallet. The length of the V is made big enough to support a barrel through the groove. The gunsmith would have used two or more of these support blocks to support a barrel. In order to ensure that the support blocks don't move, the gunsmith would have either nailed the blocks or glued them into the proper positions on the machine. Another common technique used was to drill a couple of holes into the base of each support block and into the bed of the machine and use cylindrical wooden pegs to hold the support blocks in place. The gunsmith could optionally also use C shaped strips of metal and screws to clamp the barrel to the support block. These could be used by themselves, or in conjunction with the barrel clamps we studied in the previous post. The next part we will study is the bed of the machine. This is simply a long plank of wood, with holes drilled in specific places, so that the various other parts (such as the support blocks and barrel clamps) can be attached to it. As we saw in an earlier, mankind had already invented drills and reamers centuries ago, so these tools were easily available to gunsmiths in the 16th century. And as for ensuring that the surface of the bed is flat, the tools to do this were also invented by carpenters a long time ago. Ancient carpenters used a tool called an "adze" to make wood planks. Adzes have been known to exist since the Stone Age and were used by many cultures around the world (Egyptians, Mayans, Europeans, Indians, Chinese, Maoris, Polynesians, Hawaiians, Native Alaskans, Zulus etc.). Some time during the Roman era, the plane tool was invented to replace the adze and rapidly spread to several countries around the world. Examples of plane tools have been found in the ruins of Pompeii. Therefore, we can safely assume that gunsmiths in 1550 AD would have had access to good woodworking planing tools. A Roman woodworking plane tool. Click on image to enlarge. A modern planing tool made by Stanley Tools. Click on image to enlarge. In the above images, we see two plane tools. The first one dates from the time that the Romans ruled England and the second one is a more modern version made by Stanley Tools. It is interesting to note the similarities between the two hand tools, considering that they are separated by almost two thousand years. The manual plane tool is only seen in small home workshops these days, as it has largely been replaced by the electric planers for quicker production. Finally, our ancient gunsmith would have constructed a set of table legs to attach to the underside of the bed. Again, this is something that practically every village carpenter in Europe or Asia already knew how to build for thousands of years, so gunsmiths weren't inventing anything new. In the next post, we will see how all these parts were assembled into a rifling machine that ancient gunsmiths used. Oh I'm still paying attention. Fascinating, that bit about the planes. I guess it's like that old saying, if it ain't broke, don't fix it.